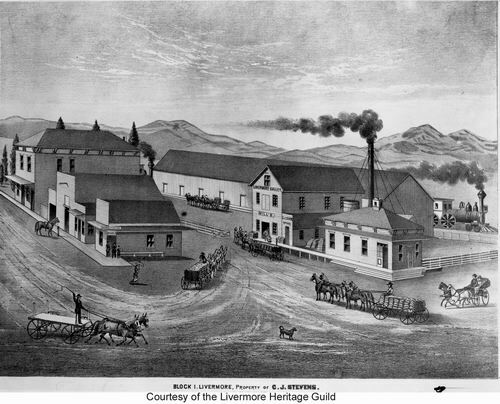 The corner of 1st and Livermore is often referred to as "Mill's Square" or "Mill Square", named for the Livermore Valley Mill which was in the area behind the 1st St buildings, where the (former) Albertson's shopping center is now. 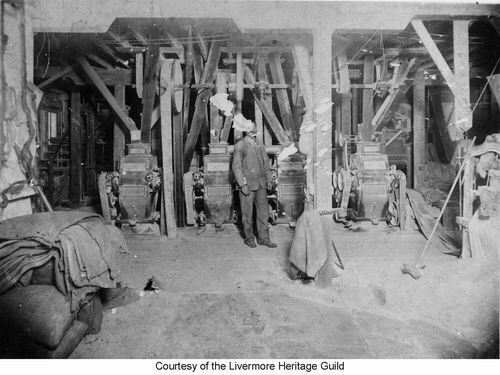 There is a plaque in the park on the South East corner of 1st & Livermore which reads "Mill Square in honor of Calvin J. Stevens"
After the Livermore Valley Mill burned in 1881, the Diamond Flour Mill was built on east 1st Street in 1884. 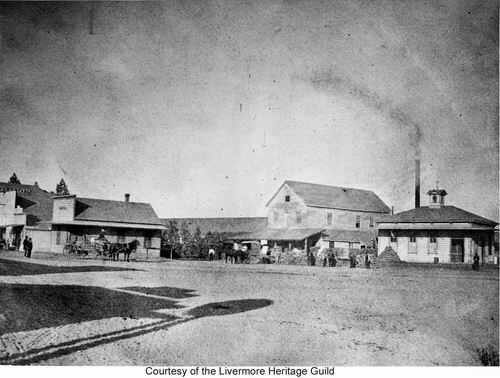 The 1889 Drawing labels this as the "Livermore Flouring Mill"
Drawing of Livermore Valley Mills. "Block 1 Livermore Property of CJ Stevens" NW corner of 1st and Livermore. About 1874. The mill burned on October 16, 1881. The street on the far left is 1st St. In the foreground is Livermore Ave. The train is on the SP tracks. The old Albertsons building occupies that area now. Signs on buildings in the middle: "Livermore Valley Mill's." and "C.J. Stevens Office"
Carts are carrying bags of flour. Sign on the end building on first street: "Magnolia Saloon"
The two story building at the left is the IOOF building, prior to its expansion. It was built in 1873 and expanded in 1874. Photo from roughly the same angle as the drawing, but lower elevation. An overhang is now added to the center building. There are a lot of bags of flour stacked in front of the buildings, and on the cart. The mill burned on October 16, 1881 and was not rebuilt. The only sign that is readable is on the far left roof. It reads "Livery Stable"
The shadows at left are presumably coming from a building on the south side of 1st St. I have been unable to match the pattern of the shadows to other photos. Diamond Flour Mill on the north side of East First St, opposite Independence Hall (First & McLeod). H P Hansen on Platform. After the Stevens Mill burned, a mill was built on this site in 1884 by a Mr. Laumeister. That mill burned in 1896. The mill in this photo was erected in 1906 by H P Hanson and C A McClain and was in operation from 1906 until 1918. This photo was presumably taken during that time period. The building was torn down in 1936. Additional photos here. "Tip Top Flour, Bran, Middlings, Rolled Barley"
Sign on the wall above the bags says "Barley" the bags themselves say "Tip Top"
Inside a Grain Mill. 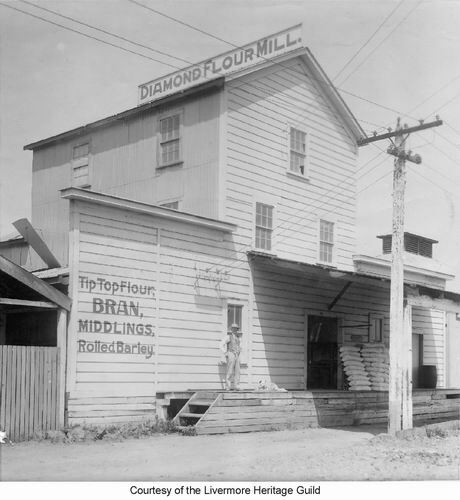 Probably the Diamond Flour Mill above.